Is Sulwhasoo First Care Activating Serum EX Worth to Buy? 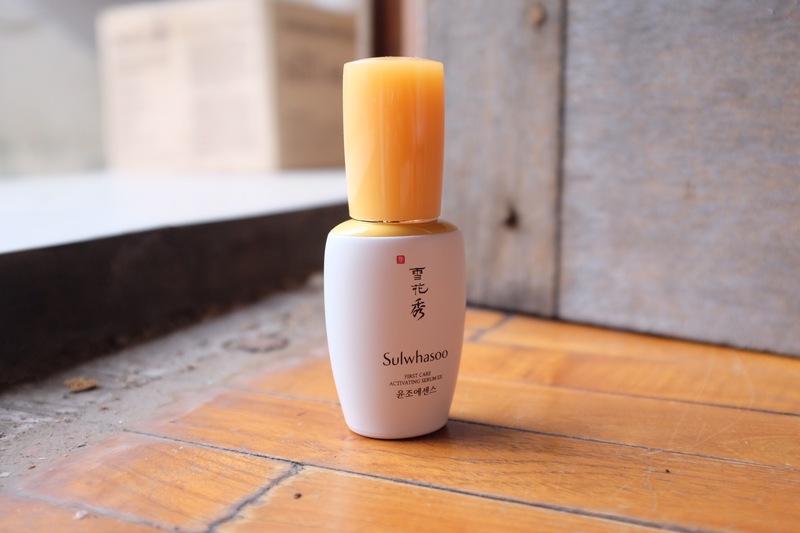 I first reviewed the original Sulwhasoo First Care Activating Serum in Female Daily website, you can read the article here. It’s among the very few first booster/first essence/serum that I’ve tried and love, along with SK-II First Treatment Essence and Menard Beauness. The original one though an effective first essence, especially for those with acnaic and normal to oily skin, it’s not hydrating enough for my skin. It’s great for acnaic skin because it helps to bring your problem to surface and clear out skin. It also balances your skin nicely if you have oily skin. However, this reformulated version of Sulwhasoo First Care Activating Serum EX has all the benefit of the original one. Still great in texture, seeps into the skin fine, but with the addition of being more hydrating! It’s almost on par with SK-II FTE in terms of hydration and a little below Menard Beauness. It’s still works great on unbalanced skin. Great to boost the performance of your skincare. Other than how it feels hydrating, the texture and finish as well as other aspects of this booster that I love still remain the same. So the original review that I wrote for Female Daily still stands. Here’s a short wrap up. I’m not a big fan of cleansing oil, so there are very little cleansing oil in the market that I’ve tried. The reason is because I find cleansing balm and cream much more comforting to use on my dry skin. But I must admit cleansing oil is the easiest to use to remove makeup, especially if you’re using waterproof eye makeup such as eyeliner and mascara that are fibre-based and made in Japan. God, they’re really hard to remove! Anyway, eventhough cleansing oil melt away all makeup in one swipe, never forget to emulsify it first. If you haven’t already know how to use cleansing oil properly, read this article on all about cleansers (unfortunately written in Bahasa Indonesia). From my recent trip to Japan, I picked up two renowned cleansing oil from brands that I’ve trusted. They are the DHC Deep Cleansing Oil and Fancl Mild Cleansing Oil. Here’s what you need to know first about both cleansing oil: their ingredient list is pretty short (although I can’t really tell what’s inside Fancl since it’s in Japanese) and they’re free from mineral oil. I have no problem with cleansers that use mineral oil, but I know most people out there mind. We’ll start with the famous DHC Deep Cleansing Oil. Nowadays Hyaluronic Acid (HA) serum isn’t foreign anymore. But back in the days, hydration serum is almost unheard of. What people want is a mattifying cream or serum. So where does that leave us the dry-skin group? The benefit of HA serum doesn’t only favour those with dry skin but also those with oilier skin. Because whether you have dry or oily skin, it’s only a matter of oil production. When we’re talking about dehydration, we’re talking about the skin’s water level. That’s where HA serum comes to the rescue. Anyway, like I said, back in the days the concept of HA isn’t so widely known. Except of course to the Japanese which has been using it for years – whether in their toner or essences. So it’s not a surprise my first encounter with HA serum came from Japanese brand SK-II. When I first handed Facial Treatment Repair C more than a decade ago when I’m having troubled skin because of dehydration, I never knew that my skin could be so supple and hydrated. It’s been so parched and dry all my life, especially with all the changes in my life, that I believe the state of my skin is unrepairable. Why Menard Lisciare Cleansing Cream worth the splurge? As I’ve previously mentioned practically everywhere, Menard is one brand that I truly love and that is not without reason. I love Japanese skincare and I love a Japanese skincare product that truly delivers. I’ve previously reviewed the Tsukika cleansing cream, which is their starter line and I must say quite affordable as everything is priced between IDR 300,000 – 480,000. Now meet the older sister Lisciare, which tackles problem of skin elasticity and it opts to increase the water density of the skin so your skin looks more supple and bouncy, skin elasticity and firmness improves. The price of Lisciare is double the price of Tsukika. Take for example the cleansing cream, Tsukika is priced at IDR 300,000 whereas Lisciare is priced at IDR 660,000. So why bother picking up Lisciare when you have Tsukika at half the price? I think it’s inevitable for those with medium to tan complexion wanting a brighter skin. So sometimes we resort in an instant solution – those evil Vitamin C injection, yes there’s such thing! I know the celebrities are doing that for a boost of energy, but in this part of the world, many are doing it without professional supervision for beauty related reason. Very dangerous endeavour I must say. So instead of the dangerous path to instant solution, I present you something that will make your complexion instantly brighter at a reasonable state but still very safe. Mind you, it will make your skin brighter but at a normal state, not brighter than your original skin complexion. It’s a white clay product that is actually a foam cleanser that you can use as a normal cleanser. Similar to the Glamglow cleansers. Once it touches water, it will transform into a clay. How to use it? Apply liberally allover your face, on a clean face and dry skin. Leave it for about three to five minutes because it’s sort of like a quick mask. Wash with warm water while massaging the clay in circular motion until it all transform into foam and lather off. I prefer to use it as a second cleanser because that way I can get the maximum effect of the product. My Instagram followers know well that if there’s one brand that I love head over heels that would be Menard. I’ve just realised that I have very few Menard products reviewed yet. Except for the exception of the few posts that I’ve written for Female Daily, which for the purpose of sponsored review. Even my favourite go to line for hydration, Lisciare, I don’t have any single review yet on this. As such, it will be my mission to get through the list of reviewing Menard products. Starting with Menard Tsukika cleansing cream! Let me start with brief explanation on the Tsukika range. It’s the most basic range from Menard and product pricing starts from IDR 300,000 (cleansing cream) – IDR 480,000 (cream). I was shocked at first knowing that Menard actually have a line that’s quite affordable considering they have IDR 15 mil cream as well! This range is perfect for those who just starting to use skincare and don’t know where to start as this offers basic maintenance for your skin. It’s also perfect if you don’t have any problem with your skin and want to try Menard for the first time. Especially if you’re under 25. But if you’re somewhere above 28 and starting to feel the need to add more juice to your skincare I would suggest to opt for Liscare instead. The star ingredient in this range is Selenicereus flower extract or Bunga Wijaya Kusuma which only blooms on midnight. The scent of the whole line resembles closely with this flower and it is a delightful faint floral scent. I get asked a lot what moisturiser would be great for combination or oily skin? Well, it’s hard for me to recommend anything because I have a very dry skin. My skin drinks up any hydrating product like there’s no tomorrow. But I imagine this product from Dr Jart named Most Moist Water-Sure Gel Cream would be a perfect moisturiser for every skin type, including those with combination and oily skin. Theoretically, combination and oily skin will still need hydration because their skin though producing more oil but they still need water to give the skin hydration or else it will compensate the lack of hydration by producing even more sebum. What both of these skin types need is the balance of hydration between oil and water not depriving the skin of both which create imbalances to the skin. A light, oil-free and/or gel type moisturiser would be the perfect kind of moisturiser for these types of skin. In theory. But you can test this theory yourself and let me know how it works for your skin. Dr Jart Most Moist Water-Sure Gel Cream. For Asian and UK market the line is called Most Moist but for the US market it is called Water Fuse line. A refreshing, oil-free gel cream moisturizer infused with hyaluronic acid to hydrate and plump skin all day. This refreshing, oil-free gel cream binds moisture to the skin for long-lasting hydration without stickiness, while olive leaf and cranberry strengthen the skin barrier to boost elasticity. Dr. Jart+ Most Moist Water Sure Gel is a refreshing anti-ageing moisturiser ideal for dry and dehydrated skin types. Specially formulated for prolonged moisturisation, Most Moist Water Sure Gel is enriched with natural Botanical Extracts such as Oat and Cactus which firm and lift, whilst hydrating the skin without irritation. With a gel cream consistency, Most Moist Water Sure Gel removes dead skin cells and smoothes rough, dry skin for a smoother surface texture. Basically I would say for anyone who needs hydration but you want something with light texture. Whether you have dry, normal, combination or oily skin, if the keyword in your search of moisturiser is “hydration” then this could be it. Especially great to use during day time or if you’re keen in layering in skincare products. This will not add up “weight” to your overall skincare layers.